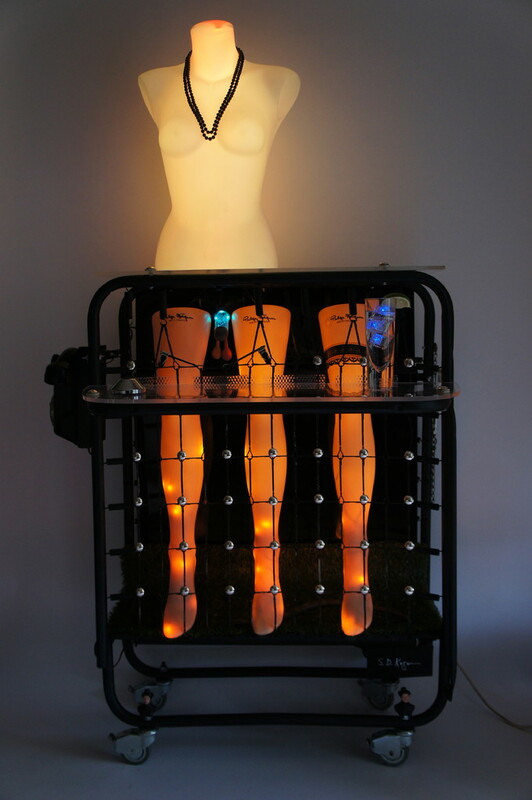 Kinetic light sculpture, "Honor Thy Thirst", created by Sanford Kogan in February 2013, is captured in this video by the same name. Celebrating color, diversity, and other "exotic tastes", it is intended as a statement about openness and tolerance. Consisting of found objects - fold away bed, parts of a plastic mannequin, lamp bulb from film projector, B&W 35 mm film, porcelain busts, and a telephone that has been rewired to play song "I Can't Give You Anything But Love", as recorded both for the sculpture and for this video by Malcolm Potter. ( see www.malcolmpotter.fr for additional info) Sculpture lit by color LED's and Christmas lights.